Home > Sports > Basketball > Thunder Rolls Over Bradford … Again! 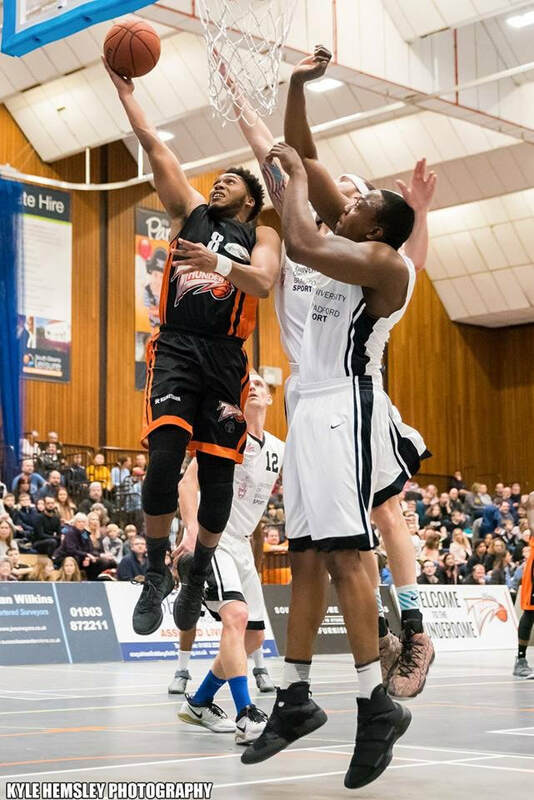 Worthing Thunder completed a clean sweep of victories over the Bradford Dragons, with a 98-67 victory in the National Basketball League, at the Worthing Leisure Centre, on Saturday evening. Bradford are yet to register a win in 2019 and this defeat came hot on the heals of their exit from the National Trophy, having lost their semi-final fixture, in the Dragons’ Den, also against Worthing, the previous weekend. In fact, it was the fourth time that the two teams had met this season, with Worthing having taken the spoils in all three previous fixtures. The Dragons did put the first points on the board, a three-pointer from Rafi Saipe, after their hosts had missed their first three attempts at the basket. Rihards Šulcs then made it 0-5 to the Dragons and Andreas Lycoudis sank two of his three free throws to give Bradford a seven-point advantage. With just two and a half minutes played, Šulcs dropped in another two, and, with the hosts yet to get off the mark, the Dragons held an early 0-9 lead. ​The hosts reduced the deficit to five before Saipe sank another two for the visitors. However, by now Worthing had found their mojo and with just over six minutes played, they tied the game at 14-14. 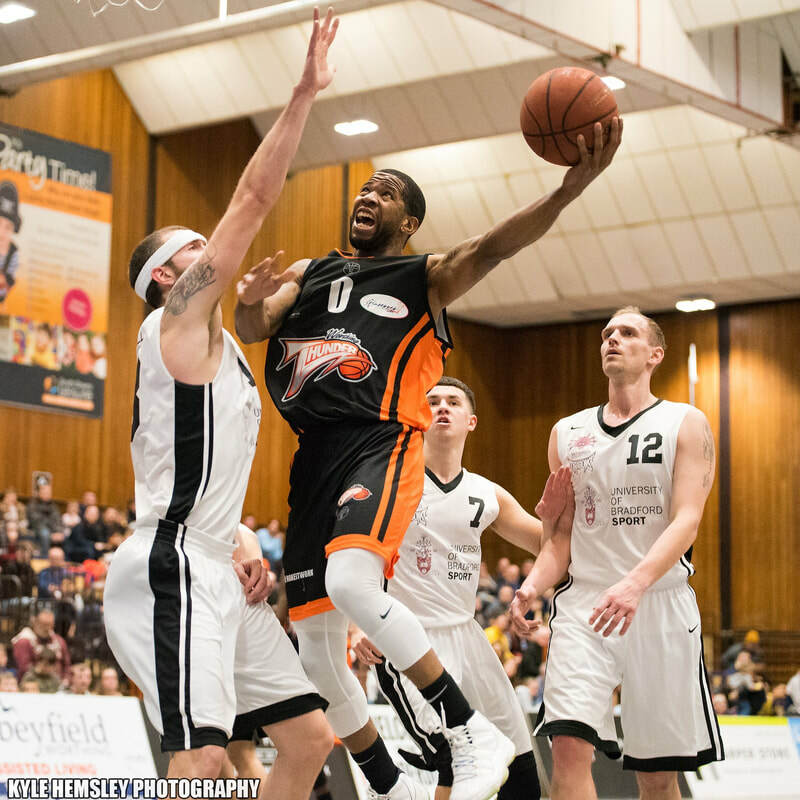 Sulcs restored the lead for Bradford; however, that was to be the last score of the opening period for Bradford, as Worthing opened an eight-point lead (24-16) before the first buzzer. Any hope of Bradford getting back into the game was totally destroyed in the second quarter, which saw a rampant Worthing side, spearheaded by the irrepressible Jorge Ebanks, sink thirty-seven points, whilst Bradford could only muster up a measly eleven. As Chris Mellor’s side returned to the locker rooms for their half time refreshments, they already looked down and out, on the wrong end of a 34-point margin (61-97). After the break, the Dragons enjoyed a far better third quarter. Despite Worthing sinking an early three-pointer, to extend their lead further, The Dragons responded and restricted their West Sussex hosts to just ten points, whilst they themselves added twenty points to their own total and reduced the deficit to twenty-four points (71-47). It was a huge ask to expect Bradford to overturn such a large gap in the final quarter, although Joaquín Calvo bucketed his floating jump shot, for two points, within the opening four seconds of the period. Clayfell Harris then added a single from the line to reduce the gap to twenty-one. However, Worthing upped the tempo and went on a spree of their own and with only five minutes on the clock, they were in total control, at 86-58. The Dragons couldn’t match the intensity of Thunder’s play, and when the final buzzer sounded it was the home side that claimed a thirty-one-point victory (98-67). Saipe led Bradford’s scorers with 19 points, whilst Ricky Fetske record a double-double with 13 points and 14 rebounds. There was no dispute over who was the player of the game, with Worthing’s Ebanks recording 32 points, 5 rebounds and 6 assists. Zaire Taylor also scored big, with 21 points (also registering a double-double with 10 rebounds, but narrowly missing out on the triple with 9 assists). Bradford will be looking to get back onto the winning track when they entertain Derby Trailblazers this Saturday evening. Derby won the reverse fixture earlier in the season, however the Dragons will be hoping that home advantage will play in their favour. The game tips off in the Dragons’ Den at 6:15pm. Advance tickets are available via the club website.